Earlier this month, we reported on the favorable media that Kellogg won by announcing new guidelines for marketing to children. See, for example, the coverage from WebMD, including high praise from independent health policy folks. Here is the laudatory press release from the Center for Science in the Public Interest (CSPI), which dropped a lawsuit about marketing to children after Kellogg's announcement. 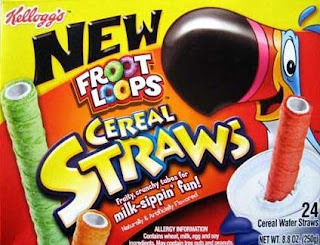 This week the Consumerist, BoingBoing, and the Impulsive Buy covered the introduction of Kellogg's new Froot Loops Cereal Straws, which sweeten the milk children drink as it passes through the straw, in order to achieve the same effect as the sweetened milk left at the bottom of a bowl of Fruit Loops. Ingredients: WHEAT FLOUR, SUGAR, VEGETABLE OIL (PALM, SHEANUT, AND COTTONSEED OILS), MALTODEXTRIN, FRUCTOSE, NONFAT MILK, CONTAINS TWO PERCENT OR LESS OF GLUCOSE SYRUP, EGGS, SOY LECITHIN, SALT, ARTIFICIAL FLAVOR, PGPR (POLYGLYCEROL POLYRICINOLEIC ACID), NATURAL ORANGE, LEMON, LIME AND OTHER NATURAL FLAVORS, YELLOW #6, RED #40, YELLOW #5, NIACINAMIDE, BLUE #1, VITAMIN A PALMITATE, PYRIDOXINE HYDROCHLORIDE (VITAMIN B6), TOCOPHEROLS FOR FRESHNESS, RIBOFLAVIN (VITAMIN B2), THIAMIN HYDROCHLORIDE (VITAMIN B1), SESAME FLOUR, VITAMIN B12, VITAMIN D.
Each serving of three straws provides 140 calories, including 12g of sugar and 3.5g of fat, including 2g of saturated fat (10% of the daily value). Look at the image and ask yourself if the target audience is parents or if this product is being marketed directly to children. We'll keep an eye on the height of grocery store shelf placement for this product. I can't criticize the folks who praised the earlier Kellogg announcement. They face difficult decisions in assessing what battles are winnable. But this example does illustrate well the limits of voluntary corporate self-restraint. One of the things I will miss most in returning home to Boston after six weeks on a work assignment in France is the cycling culture here (please stop snickering, this is serious). Except for a one day car rental to pick up my family from the airport in Geneva, which was an adventure, we have relied entirely on non-automobile transportation. Even real cities like Geneva (just over the border in Switzerland) or Annecy have bike lanes all over town. The automobile traffic is usually considerate of cyclists. The countryside is full of regular riders of all ages and shapes, and also world-class athletes. My family got to see the latter race in the Criterium Dauphine. I also get to see them in teams, from behind, as they pass me on the roads cruising along at perhaps double my pace. Sometimes, they have a cheery word of condolence for me -- pointing out in French as best I can tell that the headwind is strong, as if that would explain why I alone am affected. Every type of public transportation seems to accept bicycles. The inter-city bus driver will stop and block traffic in order to open the cargo area for a bicycle. On Saturday, my family caught a special city bus from Annecy to the peak of a mountain called the Semnoz. Fully half of the interior of the public bus was dedicated to hooks for mountain bicycles, and every single hook was filled. The cyclists have what looked to be a glorious reckless path downhill back to Annecy. Then, a couple days later near the Mt. Blanc range, there were kids with mountain bikes on a cable car ride! The rail-to-trail bike path nearby from Annecy to near Albertville is the best I have ever traveled for length, quality, and landscape. The mountain roads are nice too. 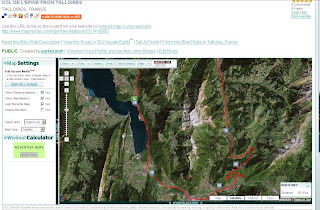 Here is a Map My Ride link and image for my favorite ride this summer, a loop from Talloires around the La Tournette range and then over the Col de L'Epine, which will be part of the Tour de France this year. Among the various explanations for the "French Paradox" -- the surprisingly moderate rates of obesity and chronic disease amidst a culture of enjoying plenty of delicious food -- some scientists focus on the modest traditional portion sizes or some magic chemical in the skin of red wine grapes. But, watching all the walking and bicycling, and the priceless treasures of public investments in facilities for non-automobile transportation, I can't help wondering if the output side of the energy balance equation deserves the credit. The U.S. beef industry is in an uproar this month over a policy adopted by the U.S. Congress in 2002, but never yet implemented, which would require a label to inform consumers about the country of origin for meat products. 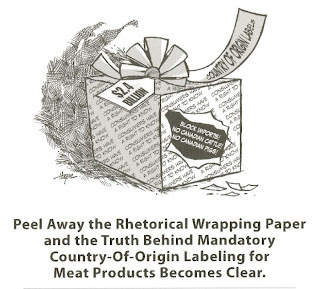 The American Meat Institute (AMI), which represents packers and processors, has lobbied heavily against country-of-origin labeling (COOL) and published a fierce print ad (.pdf) accusing COOL supporters of being protectionists (see image below). If AMI professes to know what requirements the Secretary intends to impose on industry participants to implement the COOL law, then AMI must have been involved in unlawful, ex parte communications with the Secretary in order to obtain such knowledge. If this is the case, then the Secretary’s action of June 15, 2007, to reopen the public comment period for 60 days for the proposed rule for COOL for beef, lamb, pork, and other commodities is a shell game, inasmuch as the outcome of the rulemaking process is already known by AMI before the agency even considers public comments. If you don't believe the fix is already in, express your own view about whether producers should be required to inform you about the country of origin for your meat. Submit your own public comment to USDA before August 20 (see here for current links and here for instructions on submission). When you are in the leadership circle you have to lead by example and that's not what we are seeing. The context, according to the newspaper's sources, is that the United States came to the talks with an offer to cap major trade-distorting subsidies at $17 billion, although current subsidies in this category are $11 billion, so the "cap" is not even a functioning cap at present. In a revealing turn of phrase, the "leadership circle" Schwab criticized was not the United States or the European Union, but rather Brazil and India, the leading representatives of developing countries in these negotiations. A high-level meeting aimed at salvaging sputtering global trade talks collapsed on Thursday as the United States and the European Union fell out with India and Brazil over plans to slash agricultural subsidies and tariffs. The four members of the World Trade Organization were trying to break a persistent deadlock that has bedeviled the Doha round of negotiations since 2001: How deeply rich countries will slash the domestic farm subsidies that have distorted trade in commodities like cotton, sugar and corn. The tragic inability to offer developing countries a pro-market route to economic development is one of the fruits of our refusal to reform agricultural subsidies here in the United States. A House subcommittee considering the 2007 Farm Bill on Tuesday rejected every proposal for reform and voted to continue the status quo of subsidy programs from the 2002 Farm Bill for another five years. The full House Agriculture Committee will consider the subcommittee's decision in early July, after which there may be an unusual fight on the floor of the House of Representatives. The current Farm Bill, passed in 2002, spends billions of dollars each year in subsidies that go in large part to an elite group of immense farm businesses. These businesses principally grow row crops such as corn and soybeans that are used for animal feed to support the industries that produce our milk, cheese, beef, and pork. There are almost no such subsidies for fruit and vegetable growers. To a great extent, the ultimate beneficiaries of the subsidies are not farmers but landowners, whether they live near the land or not, who can charge farmers higher rents because of the subsidies. Due to high land prices, the subsidy system helps prevent young farmers from taking up their parents' work. The current Farm Bill is ineffective in supporting rural economies in the United States. In the current Farm Bill, subsidies are only partly disentangled from farmers' decisions about how much to produce, so the government programs encourage overproduction. This overproduction damages the environment and helps suppress world commodity prices, which immiserates farmers in the developing world. Thus, the current Farm Bill helps make the world's poorest people yet more poor. This is the status quo that the House subcommittee voted to continue for another five years. Today’s vote is Exhibit A in the case for not letting farm subsidy policies be decided by the subsidized. 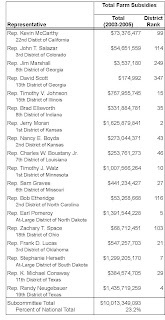 The subcommittee asked itself: Is the current inequitable crop subsidy system the best that we can do with billions of dollars of taxpayers’ money every year? And the subcommittee answered, unanimously: Yup! There is excellent dispassionate yet punchy coverage from Keith Good's Farm Policy, the Washington Post, and the New York Times, and there are good action links for outraged readers from Ethicurean. Source: Environmental Working Group (.pdf) (excerpt, follow link for complete file). The 2007 Farm Bill is currently being crafted in Congress and will hopefully be completed by the time the fiscal year ends in September. Enacted approximately every five years, the Farm Bill reauthorizes most of the agricultural subsidy, natural resource, and food assistance programs under the jurisdiction of the U.S. Department of Agriculture. The administration submitted its Farm Bill proposals at the beginning of the calendar year; currently, both the House and Senate Agriculture Committees are working on drafting their versions of the Bill. Some of these drafts (for the House), as well as amendments, can be found here. Here are many resources for information about the issues surrounding the bill as well as specific policy platforms from a variety of organizations ranging from anti-hunger and nutrition to farmers and sustainable agriculture. For basic info, see Farm Aid's "Farm Bill Study Guide," or World Hunger Year Food Security Learning Center's U.S. Farm Bill page, or check out some of the links on Michael Pollan's website (.pdf). For more in-depth, unbiased reporting on the Farm Bill, along wither other agriculture policy issues, check out the Farm Policy blog. The Northeast Sustainable Agriculture Working Group (or NESAWG), while maintaining its own particular issue platform for the 2007 Farm Bill, has links to a number of other policy platforms on its website, including those from farmer, sustainable agriculture, and anti-hunger groups. Several groups are organizing around the Farm Bill's connections to public health: For background reading about these connection, see Public Health Action or this action item. For a historical perspective, the National Agricultural Law Center contains both summary and full text for past Farm Bills dating back to 1933. To purchase an easy-to-read yet comprehensive overview of many Farm Bill issues (with the warning that the author has a definite set of policy objectives in mind), Food Fight: The Citizen's Guide to a Food and Farm Bill by Daniel Imhoff was released several months ago, just in time for the 2007 Farm Bill. For a select set of marker bills that have been proposed, see the Farm & Food Policy Project's website. Stay tuned for upcoming posts about key Farm Bill legislative actors and a timeline of Farm Bill legislative events. The voluntary changes, which will be put in place over the next year and a half, will apply to about half of the products that Kellogg currently markets to children worldwide, including Froot Loops and Apple Jacks cereals and Pop-Tarts. Frosted Flakes, for example and Rice Krispies with Real Strawberries will still make the nutritional cut, though regular Rice Krispies will not (too much salt). The new policy, though modest in scope, was sufficient to prompt the Center for Science in the Public Interest and the Campaign for a Commercial-Free Childhood to drop Kellogg from a lawsuit in which two Massachusetts families formally complained about advertising practices toward children. The other party to that lawsuit, Viacom, was not involved in yesterday's announcement. Food stamps versus private voluntary assistance? Having a sense of social justice does not automatically mean a person endorses all food programs for the poor. There has been a thoughtful, fairly gentle, literature over the years, in which some anti-poverty advocates raise important concerns and questions about the food bank network that supplies the nation's charitable soup kitchens and food pantries. Perhaps the most notable reference is Janet Poppendieck's book, Sweet Charity. A recent, provocative, contribution -- available without fee on the internet -- is a December article (.pdf) by Beth Osborne Daponte and Shannon Bade in the journal Nonprofit and Voluntary Sector Quarterly (in the blogosphere, see also this summary). Notwithstanding the private character of the charitable food donation system, Daponte and Bade attribute its rapid growth in recent years to public policy -- that is, changes in the government's commodity donation programs such as The Emergency Food Assistance Program (TEFAP) and changes in the FSP that leave participants in need of inexpensive supplementary food sources. About TEFAP, they write: "Compared to the FSP, TEFAP is administered inequitably and in an ad hoc manner." Daponte and Bade discuss one sign that the private system is not entirely complementary to the Food Stamp Program: the surprisingly high rates of FSP non-participation by food pantry participants. Here, for example, is a graphic from an ERS article by Laura Tiehen in 2004. One can think of a number of ways in which the Food Stamp Program serves low-income Americans better -- it's larger in scale, it uses the strengths of the market economy better by employing normal retail channels, it is less patronizing, and it offers families greater choice over what to purchase. This is my third week working in a medieval priory in the small village of Talloires on the shores of Lake Annecy in France. I get my freshly baked long loaf of bread and news about the weather from the village boulangerie early each morning. I get my cheese and vegetables from the farmers' marche in the afternoon. But what has been most fascinating hasn't been these traditional food retail sources. If you imagine the most stereotypical French village bakery shop, vegetable stall at the farmer's market, and rustic dairy cheese store that you can, you'll have it exactly right. What more could I describe? Instead, I keep noticing the strangely unfamiliar features of the more "modern" food sector. At the "Monoprix" in the nearby city of Annecy, the cashier sneers at you if you require a shopping bag. To an extent that would be astonishing in the United States, everybody here packs their groceries into their own reusable bags even in modern supermarkets. There is a "8 a huit" -- literally "8 to eight" -- in the middle of the village, which has modern signage and looks like a Seven Eleven in the United States. You'll notice, though, that there are fewer hours in the retail chain's title, and that's the least of it. In addition, the store closes for two hours at lunch. You might fear the "8 a huit" would push the local boulangerie out of business, but not at all. The baker is the source of bread for the "8 a huit." An American friend on the faculty here once went to the "8 a huit" in the afternoon and asked for some bread. The shop-keeper said they were out of bread for the day. My friend pointed to the American style wrapped factory-made sandwich bread. Oh that, said the store-keeper with disdain, and sold some. On television here, George Clooney peddles Nescafe with a kitschy ad in which he flirts with two pretty women who are describing something with adjectives like "full-bodied" and "sophisticated," but it turns out to be the coffee not the movie star. There are advertisements for McDonald's on the television, but they run with a news ticker along the bottom warning you to eat plenty of fruits and vegetables, along with a link to a national website (see accompanying images), somewhat akin to the Dietary Guidelines for Americans. The label for my container of table sugar includes advice not to eat too much sugar. From the tenor of food labeling and dietary guidance political debate in the United States, one would think that such policies would cause a complete collapse of the food system. But, they seem to be doing just fine.